This is the second part of the origins of San Diego surfing. In part one, the oldest living surfing pioneer, Emil Sigler, 94 recounted his days surfing Mission Beach in the 1930s. 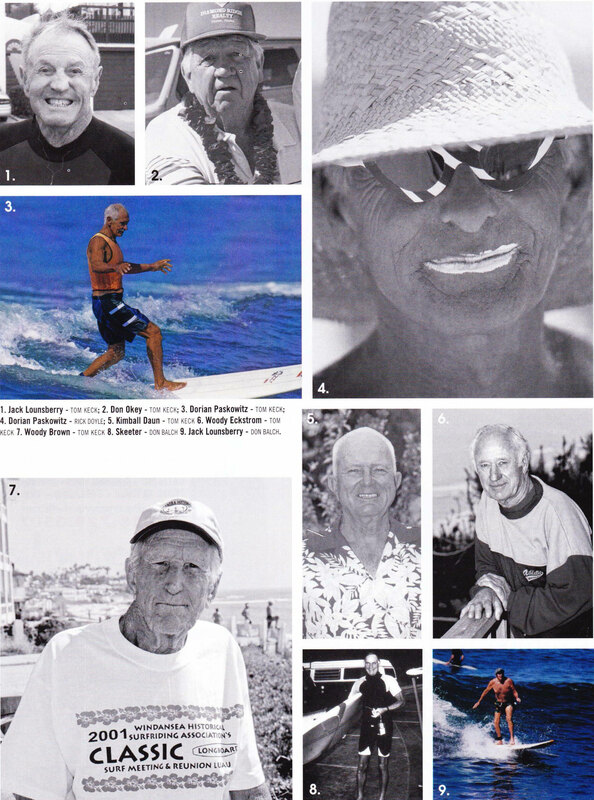 The patriarch of the most well-known surf clan, Doc Paskowitz was also profiled, as was larger-than-life character Woody Brown, catamaran innovator, world-record glider pilot, and perhaps the first San Diego surfer to use a fin. Also mentioned was San Diego’s first big-wave maverick, Dempsey Holder. Part 2 of the history of San Diego surfing will focus on one of the first surfers to surf the big-wave break, the Tijuana Sloughs; a couple of pioneering shapers and one of the first of many characters to have called Windansea home. William “Hadji” Hein is one of the first big-wave surfers to paddle out at the suicidal border break, the Tijuana Sloughs. Hein is 86, but looks 20 years younger. Hadji got his nickname from Emil Sigler (see part one), who read in a newspaper about Arabs going to Mecca on pilgrimage. Hadji frequently wore a shirt around his head to block out the sun, turban style, hence the nickname. Hadji grew up surfing Mission Beach and Sunset Cliffs, beginning in 1937. When asked what breaks he surfed, Hadji responds, “In those days we didn ‘t have fancy names for breaks, there was no hype like they have now. The only special name that identified a break was Garbage at Sunset Cliffs. Today, it seems that every 100 yards they have a name for a break.” Hadji remembers an era when surfing was more about camaraderie and the Aloha spirit. “We’d often play instruments on the beach and sit around the campfire,” he recalls. The first boards that Hadji rode were shaped from balsa blanks that were shipped in planks from LA’s Pacific System Homes. “Our boards were 60-100 pounds,” he says. Not only was paddling out at the Sloughs crazy, but trying to catch a monster wave with a primitive board was outright insanity. Hadji has fond memories of his fellow surf pioneers. He splits the pioneers into three groups, the Ocean Beach Vandals (another nickname given by Sigler), which consisted of Kimball Daun, Skeeter Malcolm (a high school principal who convinced many of his buddies to pick up surfing long after they gave it up because of the war and family responsibilities ), Bill Sails and Bill Nelson; The Mission Beach crew of Don Pritchard, Emil Sigler, Lloyd Baker, Dorian Paskowitz and JB Asher (believed to have been the first person to surf on a board with three fins); and La Jollans Don Okey, Woody Brown, Towny Cromwell, the Goldsmith brothers (Bobby and Billy), Fats Palmer and Tombstone Clark. One of the OB Vandals, Lloyd Baker is 84. Hee was the premiere shaper in San Diego County and a member of the San Diego Surfing Club. “We had the whole coast to ourselves,” says Baker, who still lives in San Diego, though he quit surfing in the 1950s, moving to Aspen for a stretch. “I lived right around the corner from Charlie [Wright], who was the first to surf Mission Beach. I surfed quite a bit with Paskowitz and then Don Okey, Skeeter Malcolm (who married Baker’s sister) and Kimball Daun. We were among the first ones to surf San Onofre, PB Point, Windansea and Pt. Loma. “We would take Emil [Sigler]‘s lifeguard truck and go surf Tourmaline and PB Point and then go back to work or school. We started surfing with old paddleboards that we built in woodshop. Then we got the balsa woods from Pacific System Homes. The blanks were shaped with drawknives and regular wood planes and we’d sand ‘em down for a nice finish. We didn’t have power planes back then. We didn’t have much money and our parents didn’t give us $300 to buy a new board like they do now. Back in those days, you’d work till you saved $25 so you could buy a plank. By comparison, kids have it easy these days. Baker remembers leaving his boards at the shack at PB point, the first one of its kind in San Diego. As for defending his record as the premier shaper of his time in San Diego, he’s rather modest about his talent. The first time Jack “Woody” Ekstrom surfed was in 1940 at Little Cove near La Jolla Shores. “I bellyrode the soup on a wood ironing board,” says Woody from his cliff top home on Neptune Avenue, which overlooks Beacon’s in Leucadia. Woody eventually graduated to the waves at Windansea and then the Sloughs in the post-war years. He thinks he first surfed the big swells offshore of Imperial Beach in 1946, an amazing feat for somebody who didn’t know how to swim very well. “We’re all known as watermen, but I really wasn’t a strong swimmer, but I was very watersmart,” says Woody. Woody went to La Jolla High and remembers getting out of class at 2:30. There was a classroom upstairs from where he and his surf-mates Isenhower, Buddy Hull, John Blankenship, Andy Forshaw, Bobby Charlton, Jim Gilmore, Bob Marquat, Jack Lounsberry and Hank lmm could check the surf. If the surf was up, Woody’s gym teacher, Marvin Clark, would let him and his buddies go surf. Woody’s home has a classic 60s-style surf vibe. You kind of feel like yo ‘re inside a ship in Woody’s home. The carpeting is lime-green shag and the wood paneling is Canadian red cedar. The view is priceless as are his memorabilia like the letters from his friends that were among the first to surf La Jolla Shores and Windansea, the latter a nirvana of anti-Leave it to Beaver beach bon fires and surf shack parties. Among Woody’s treasured articles of surf history is the ingenious water-proof camera that Doc Ball invented and used about six decades ago. Ball surfed and skated into his 90s. He was 93 when he passed away last year. The perpetually-stoked Ball is featured in the surf film Surfing for Life. Woody’s stories about camping out at the local beaches recalls seemingly simpler times, an epoch of living and breathing the ocean. Jobs, mortgage, family and bills all took a backseat to the beach. Another San Diego surfing pioneer worth mentioning during this era was Bob Simmons, a loner mad-scientist who is often credited with evolving the surfboard from a behemoth plank into a lighter weight board with the use of fiberglass, pulled in tails and putting rocker in the nose. Simmons was a master shaper, using his education at Cal Tech to influence his innovative designs. He carried with him in his 1937 Ford hydrographic charts to seek out reefs to surf. A great exhibit on Simmons and his contributions to the evolution of surfing can be found at the California Surf Museum in Oceanside. Some seventy years after surfing started catching on in San Diego, it’s time that today’s grommets learn some surf history and become familiar with names like the surfers mentioned above and other pioneers like Doc Paskowitz, Don Pritchard, Stormsurf Taylor, Kit Horn, Joe Gann, Lorrin “Whitey” Harrison, Chuck “Gunker” Quinn, and Preston “Pete” Peterson.